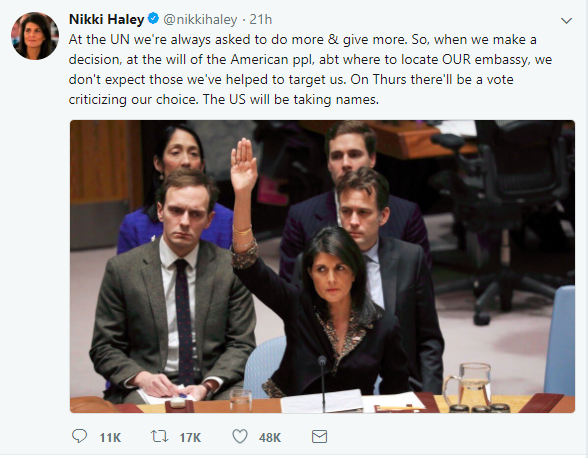 That is her tweet about the vote today at the U.N. disapproving of our decision to relocate our embassy to Jerusalem. That’s why I like this, because it’s right out of the school of thought of my own foreign policy. I had this idea on foreign aid way, way back in the nineties. I get so fed up. We give money away to people who don’t appreciate it, who don’t thank us and, furthermore, dare to criticize us all over the place. So my idea was to have an excrement list. You know, we give nations foreign aid and we monitor ’em. And if they rip us, if they criticize us, if they try to undermine us, if they don’t show us gratitude, they get on the excrement list, and they stay on that list for years. At least three years. They gotta have three years of perfect appreciable, honorable behavior towards us to get back on the foreign aid list. Why should we continually underwrite a bunch of people that are not gonna appreciate us, that are not gonna express gratitude and are gonna try to undermine us at the U.N.? 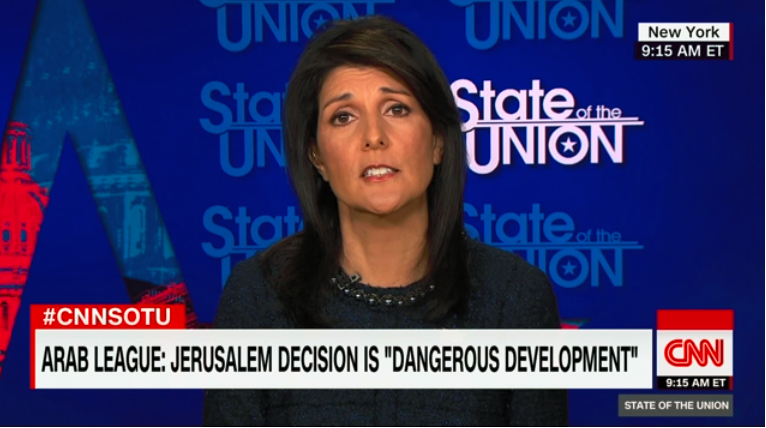 And Nikki Haley is saying here everybody’s asking us for money all the time anyway at this place, so we make a decision, the will of the American people, about where to locate our embassy — it’s not yours; it’s ours. We don’t expect those who we have helped to target us. On Thursday there will be a vote criticizing our choice. The U.S. will be taking names. She’s got an excrement list, and those nations that target us over this are gonna go on that list. Folks, I don’t care whether the list is actually in existence or not, it’s not the point. This is overwhelmingly great. This is tremendous. This is kind of representation the U.S. has not had at the United Nations or anywhere else in a generation or more. It’s all coming up roses here, as far as I’m concerned. We’re on a roll here, certainly with a lot of potential. I’m jazzed. I just have to tell you.